Been there done that. Thanx Cher. Noted, pledged and signed. Thanks Cher. Pledged,noted and signed :) Thanks Cher! 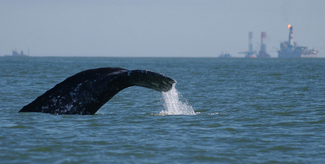 The western grey whale must be saved from extinction! Thank you for making the pledge "Stop Exxon, BP, and Rosneft! Save the Western Gray Whale from Extinction!" Took pledge,noted, signed petition and crossposted on FB. Thanks Cher! Happy to be #740. Thanks Cher.